The space on the review bench left by Roland’s Boutique TR-08 barely had time to cool before it was filled with a new instrument bearing yet another combination of those iconic letters and numbers. The TR‑8S is ostensibly an evolution of the TR‑8: the first-generation Aira performance drum machine that digitally emulated the 808 and 909. The ‘S’ is for samples, which this new TR can play alongside the original ACB (Analogue Circuit Behaviour) modelled synth drums. But the TR‑8S is not just a TR‑8 with samples, it is a more capable and sophisticated instrument all round. This comes at the price of some of the simplicity of the original, so is it a worthwhile trade-off? Although the TR‑8S follows roughly the same panel design as the TR‑8 (channel strips for 11 drum voices, and a row of big colourfully lit trig buttons) it looks surprisingly different: more modern and grown up somehow. Only a centimetre bigger, it packs in more buttons and an extra row of knobs. The original’s large Scatter knob is gone, giving way to a more conventional cluster of mode buttons, display and data dial. (Scatter is still a feature, it’s just folded into the general Fill controls). The most striking impression, though, is made by the colourful fader strips. While the original gave off a uniform glow in Scooby Doo Green, the new model can use individual colours for each fader, customised for each Kit. It’s not just the front panel that’s been beefed up, though; there’s a lot more action from the back section. In addition to the main mix outs, there are now six assignable outputs that are addressable individually or as stereo pairs. Each of these outputs can be switched into Trigger mode and used to drive external analogue synths or drum machines. On top of this is a dedicated Trigger Out, which, as on the TR-08, is fed by an independent pattern track. As with all Roland’s recent instruments, the 8S provides powerful digital studio integration over USB. Acting as a multichannel USB audio interface, it can stream all of its individual channels, and mix, into your DAW. The back panel includes a USB port, MIDI I/O sockets, an SD Card slot, a 3.5mm trigger output, and, all on quarter-inch jack sockets, a pair of audio inputs, six assignable outputs/trigger outputs, a pair of main stereo audio outputs, and a headphone port. While the Boutique instruments offer faithful recreations of Roland’s genre-defining classics, the Airas are happy to combine all the great sounds into one place and cherry-pick from what worked best in the legacy sequencing workflows, then add modern digital effects and automation. 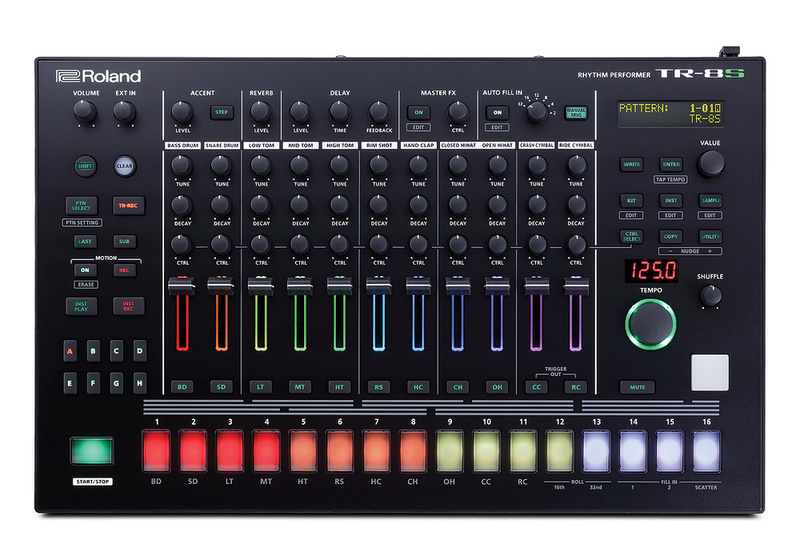 The 2014 TR‑8 recreated all the sounds from the 808 and 909, using bottom-up synthesis and no sampling. A paid expansion pack added the 707 and 727, and later the 606. The TR‑8S offers all these sound engines as standard. It would have been great to complete the set with a CR78 (a personal favourite) but I guess that’s being picky. The fact is it’s amazing to have all these sounds in one place in a single unified workstation. And as Paul Nagle explained in his TR‑8 review, if you’re unconvinced that the ACB DSP models could possibly stack up against the original transistors, you need to just hear it, believe it, and move on. All the original instruments are provided as preset kits, but of course you can mix and match as you see fit. The 11 channels are labelled with drum types — Bass Drum, Hand Clap, etc. — but there’s no restriction to which drum synth engines you place on which channel. You can have 11 808 cowbells if you like. There are 128 slots for storing Kits. Each Pattern links to a Kit, but you can choose to load Patterns and Kits independently. Like the TR‑8, each drum track has dedicated controls for Pitch and Decay. The TR‑8S adds a third knob row called Ctrl that can be assigned to different parameters on each ‘Instrument’ (track). Typically this will control a unique sound-shaping target appropriate to the equivalent voice on an original X0X machine. So an 808 or 909 snare will naturally have the Snappy parameter assigned, for example. You’re free to assign other parameters here: not just the synth model settings but other track modules like the filter or effects sends. A single extra control per channel makes a big difference, letting you expose key parameters that you want to use during live performance or motion (automation) recording. More in-depth sound editing has to be done via the screen and single encoder which can be a bit laborious. Each track’s sound source or ‘Tone’ is set by pressing the Inst button and scrolling through a list. The ACB tones, preset samples, and imported user samples are all lumped together in this list, which is categorised by sound type. Small letters appear by each item on the display to indicate what type of source each entry is. The source is independent from the track settings, which, slightly confusingly, contain the sound parameters for the Tone and for the track effects, sends and modulation in one list. There’s no real instrument/track-level data object separate from the Kit, although you can copy and paste a track’s complete settings. The parameters you see when sound editing depend on the type of Tone. All Tones get basics like tuning, decay, panning and send levels, and an independently assignable LFO. Each ACB type has a single special parameter. If the track is sample-based it get an amp envelope, and a switchable high-pass/low-pass filter with its own envelope. All tracks then get to choose one insert effect, which can be a filter or other creative effect like distortion of transient shaping. The sampler functionality is basic, it’s mainly intended for playing back single hits or looped tones, and doesn’t get into anything fancy like velocity/key zones or time-stretching. You can edit the playback pitch/speed, and start and end times. There’s no file structure, all samples appear in a single list, but they are ordered by categories, which can be the standard types (BD, SD, etc.) or custom tags. If you folderise samples correctly on your SD card they can be imported in one go and automatically assigned to categories. Samples can be up to 96kHz, with a maximum length of three minutes at 44.1kHz. The basic Pattern sequencing concept of the TR‑8 resembled the 808, with A/B variations and fills. It was somewhat limited, with only 16 pattern slots, destructive editing, and a maximum of 16 steps per variation. The S makes huge strides here. There are now eight banks of 16 patterns, multiple variations per pattern, and changes can be temporary until you commit them. You can also now easily copy and paste Patterns and Variations without stopping. There are three different ways to create a drum pattern. TR-Record mode is the classic 16-step sequencing mode using the trigger pads to gate one track at a time. Adding to this, the TR‑8S has my favourite 808 feature: a single trigger pad for live recording into the currently focussed track. This pad is velocity sensitive, and quickly became my primary method for entering triggers. Inst Rec mode is another alternative, where you can perform and record all sounds simultaneously using the first 11 of the 16 trigger buttons. Inst Play is the non-recording equivalent of this. Though I preferred tapping out my patterns using the velocity pad, I found it slightly awkward to rehearse this. Any time you select a track the TR‑8S goes into TR-Rec mode so anything you play is recorded. The workaround is to flip into Pattern Select mode after selecting a track. You now have eight Variations per Pattern, accessed via a set of buttons labelled A to H. Variations are independent patterns grouped within a parent Pattern, that can be used as you see fit. They can contain slight differences to add interest, be different parts of a song, or you can glue them together to make patterns longer than 16 steps. Any Variation can be selected for individual playback, or you can hold multiple buttons to set them playing sequentially. This structure is reminiscent of the Novation Circuit, but is a little more versatile as you can play back discontiguous chains of Variations, and you can edit a Variation that’s not currently playing. Any Variation can also be nominated as the Fill for the Pattern, although there are also two dedicated Fill slots in each Pattern. As with the TR‑8, multiple Patterns can be selected for sequential playback, with all the Variations within playing in turn. At first glance the TR-8S’ front panel is more or less identical to the TR-8’s, however, as well as being very slightly larger, the newer model has lost it Scatter control knob and gained an LCD screen. All this Pattern functionality is set up for fast switching, juggling, and real-time arrangement. There’s no permanent Song mode or arrangement editing; that’s not really the point — note that the TR‑8S’s moniker is Rhythm Performer while the TR-08/09 are Rhythm Composers. Having the Aira laid out like a mixer is a big part of this. Whereas in a typical drum machine or beat workstation I’d create pattern variations of the same drum loop with different parts present or not, there’s little need here as you can effect the same result with the faders. In this respect the faders are best used like on a DJ mixer, slammed up or down rather than for getting precious about a balance. There’s a dedicated Mute mode if you prefer, which is also useful for soloing via the Shift key. Something that would have been useful would be activity indication on the channels. With faders down or muted, there’s no at-a-glance way to know which tracks are making sound. There are no meters, but it would be great if trigger steps flashed the fader lights, or indicated in the screen’s mixer view. While I’ve got my wish list out, I’ll also mention Undo and instant pattern switching. Having a function to roll back a step after an inept real-time record is key to the way I work with, say, Maschine or Elektron instruments. Likewise, I always have those devices set to launch patterns instantly when triggered (maintaining beat position) instead of waiting until the current pattern finishes. On the TR‑8S there’s not even a ‘next bar’ option, so if the currently playing Pattern has eight Variations strung together, the next thing you trigger could be queued for eight bars, which is a spontaneity dampener. Somewhat mitigating this last omission is the excellent Fill functionality, and the Scatter feature that is now rolled into it. Each Pattern has two associated Fills that can be populated from scratch or with Copy/Paste from one of the Pattern’s main Variations. While holding the Auto Fill button you can choose the active Fill pattern for performance from either of the two Fill patterns, the Scatter effect, or any Variation. I tended to use a Variation for the Fill, or use Scatter, mainly because I kept forgetting how to get into Fill Edit mode. Triggering Fills is again similar to the classic Roland drum machines, with manual or Auto-Fill options. Auto-Fill has its own on/off button, with an 808-style time interval dial to select how frequently the fill is played. By default the manual fill button works like the 808: tapping it towards the beginning of a measure will queue up a full bar fill, while pressing towards the end of the measure triggers an instant partial fill. However, one of the first things I did was dive into the Utility settings and switch the manual fill button to Momentary mode, where fills can be dropped in and out at any time while you hold the button. Momentary fill is essential when using the Scatter feature, as it’s best served in small portions. In fact it would have been better if Scatter was triggered with a dedicated momentary trigger button, rather than having to select it as the active fill. A future Shift function maybe? It’s a shame to have to choose between the two. It’s almost like Roland were a bit embarrassed about how much prominence it got on the TR‑8 and have now swung too far the other way. Anyway, Scatter is a cool effect. It chops up, rearranges and otherwise mangles your loops in various ways and by differing amounts depending on its mode and depth settings. It’s actually a resampling type process, so it even works on external audio inputs. It’s a great for adding some occasional interest and for riding into transitions. While much of the TR‑8S builds on classic X0X features, it doesn’t abnegate modern workstation niceties. Motion sequencing is very much part of the mix, in both continuous and per-step flavours. Dedicated buttons on the left of the panel enable recording and playback of parameter automation within Patterns. With recording armed, any movement of the TR‑8S’s knobs will be captured for automated playback. The motion data is applied as a delta to whatever the basic settings are, so the knobs can still be used to make adjustments. The faders are not included in Motion control as these are always ‘live’ and not part of a Pattern’s parameter data. However, unlike the TR‑8, all other control settings and effects are saved with Patterns. As the knobs are absolute rather than continuous encoders, they won’t always reflect their actual value after loading a Pattern. You can choose whether knobs take immediate effect when moved, or take over when passing through the real parameter position. The TR‑8S also embraces per-step or parameter-lock automation. This is now implemented more simply using the ‘Swedish Method’: holding one of the main sequence trigger buttons and adjusting a control is enough to imprint a value on that step. By using this method with the Pitch control (or assigning semitone tuning to the Ctrl knob) you can program melodic sequences, which is of course particularly relevant with sampled sounds. In fact the installed sound content includes a number of tones and looped waveforms ideal for this application. Unfortunately, there isn’t a built-in chromatic playback mode as there is on many other sampler/drum machines, so it’s not possible to simply play melodies in, and while you can trigger the kit from a MIDI input, you can’t pitch sounds this way. One final bit of modern magic to season the pot is a master effects stage. This offers the same selection of useful insert effects as on the tracks. I particularly like the distortion and the combined high-pass/low-pass filter. Control is via a single knob and an On/Off button. This section provides another really effective way to add interest, breakdowns and transitions to a performance. I have to admit that as great as the original TR‑8 sounded I found it a little uninspiring and limited. The TR‑8S takes the Aira drum machine concept to a new level with sampled sounds, but perhaps more significantly with expanded performance, snapshot storage and recall abilities. In fact if it only added instant pattern take-over I’d say it has the best drum sequencing workflow of any drum machine or beat workstation on the market. And this sequencing power can be shared around with up to seven external triggers and MIDI. All this means the TR‑8S could serve as a live centre-piece rather than a single, focussed instrument. User sample import and playback are an important component too, extending the sonic range but not trying to compete with Octatrack- or Ableton-level sample and loop handling. Some of the immediacy and simplicity praised in the SOS TR‑8 review are lost in the pursuit of functionality, but the TR‑8S still has a considerably shallower learning curve than many competitors. If you need something you can set and forget with full song playlisting you’ll need to look elsewhere, but if you want to get stuck in with performing a live arrangement the TR‑8S is a pretty low-stress option that gives you a solid physical way to interact with both sequencing and mixing. It’ll also look great on stage. For us studio denizens the USB and MIDI integrations are top notch. It’s a great box that’s bound to become a classic in its own right. Taken as a complete package of digitally synthesized Roland drum sounds, plus samples, in an integrated mixing and sequencing device, the TR‑8S is a unique proposition. If you’re flexible on any of these factors, then you could widen your search. If it’s the drum machines you’re interested in you have the TR-08/09 to compare. The Elektron Analog Rytm offers a true analog alternative, which comes at a price. The Arturia DrumBrute is also well worth a look if you don’t need samples or total recall. All Roland’s ACB drum sounds included as standard. Now backed up by sample import and playback. Fluid, hands on sequencing and live arrangement workflow. Multiple outputs and trigger sources. Some ease-of-use is sacrificed for more sophisticated functionality. No way to live play tracks chromatically. 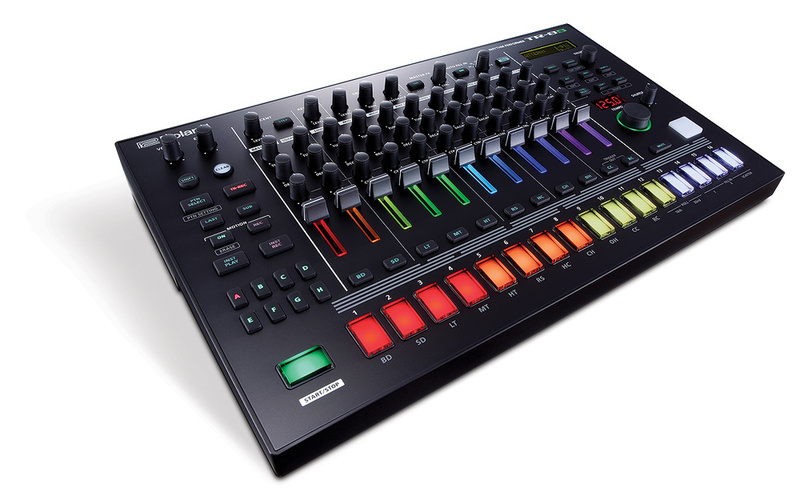 Over and above sample playback the TR-8S is a much more sophisticated instrument than its predecessor, and is an unusually easy yet powerful live performance beat workstation.